Self-fulfilling prophecy is an exciting literary technique. Because a character believes in something so much, his or her actions bring that desire to pass. In plain terms, self-fulfilling prophecy takes aim at "mind over matter." The more you imagine yourself as a success, the greater your odds are of becoming one. The more you tell yourself you're no good, the greater your odds are of falling flat. Let's imagine a novel where the main character is intent on becoming the next leader of the local book club. In the small town the book club is a big deal. There also exists an antagonist who wants that role. Of course, she only wants it so she can possess that all-powerful title; she doesn't care for reading or have the first clue about running a book club. Meanwhile, the main character is completely resolute in her ability to run that club with precision. She campaigns for herself, seeking out every opportunity to demonstrate her capabilities. All day long, she envisions herself standing at that podium, running the most successful book club in the county. Sure enough, the main character who never doubted her capabilities ends up taking the cake. Let's look at some more examples, from classic times to modern day. Oedipus Rex is one of the most well-known and illicit examples of self-fulfilling prophecy. In this Greek drama the king of Thebes, Laius, leaves his son, Oedipus, to die because he believes a prophecy that his son will one day kill him and marry his wife - the child's mother. Well, the son didn't die. Rather, he was taken in by the king and queen of Corinth. All his life, Oedipus believed the king and queen were his biological parents. So when he hears a prophecy that he is going to kill his father and marry his mother he leaves Corinth. Upon his arrival in Thebes, Oedipus kills Laius in a quarrel, not knowing he is his father. He then unwittingly marries his mother after winning the throne of the dead king by defeating the Sphinx. If only they didn't believe so strongly in his Oedipus' ability to commit murder. Perhaps the three would've lived happily ever after in beautiful Greece! Greek lore employed a lot of self-fulfilling prophecy in its writings. Fairy tales also like to use this literary device. The Story of Three Wonderful Beggars is an ancient Serbian fairy tale. It tells the story of a very rich and cold-hearted merchant named Marko. Three beggars came to his door one night, asking for shelter. Marko was about to set his dogs on them when his daughter Anastasia asked him to show some mercy. He put the men up in the stable loft for the night. The three mysterious men carried knowledge of a baby named Vasilli who would one day take Marko's fortune. Marko instantly takes this as truth and does everything in his power to get rid of the child. In the end, of course, Marko is unsuccessful and Vasilli marries Anastasia, acquires Marko's riches and more, and lives a good and happy life. Ever heard of a film called Star Wars? Now there's some brutal self-fulfilling prophecy. In Revenge of the Sith, Anakin has a dream that his wife Padme will die shortly after giving birth to their child. She is resolute in her feeling that it was just a dream. Anakin whole-heartedly believes his dream will come to pass. Anakin goes to such great lengths to prevent her death that he even joins the Dark Side of the Force. In the end, the Dark Side consumes him. Padme is devastated by her husband's turn to evil, loses her will to live, and ends up dying after child birth. What would've happened if Anakin took faith in his wife's belief that it was only a dream? Self-fulfilling prophecies tend to occur when a character is obsessive - sometimes that's a good thing; sometimes that's a very, very bad thing. In Harry Potter, Lord Voldemort believes that someone born on Harry Potter's birthday will kill him. Taking this as absolute truth, Voldemort sets out to kill Harry. In his zeal to beat the prophecy, he accidentally transfers power to Harry, giving him the means to defeat him. You probably know happens in the end. Self-fulfilling prophecies occur in everyday life, too. Let's say two recent graduates are applying for the same job. One grad believes he can fulfill the role and sits down to write the perfect cover letter. The other grad doesn't think he has a chance, having received several rejections, but figures he might as well throw something together. The first letter comes across as personable and knowledgeable. The second letter is terse and uncomplimentary. The first grad secures the interview and the job. The second grad goes through a few more rounds of applications before finally landing a lesser job. 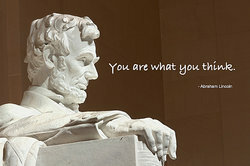 Abraham Lincoln seemed to understand the power of self-prophecy. He is quoted as saying, "You are what you think." Here's a man who became President of the United States, created the Secret Service, obtained a patent after designing a method to keep vessels afloat, and test-fired his own rifles outside the White House. Nearly everything that's recorded about Lincoln demonstrates his innate ability to fulfill his own personal prophecies. This phenomenon is not only a literary term but also a psychological term. In an article written for Psychology Today, Dr. Carolyn Kaufman describes a self-fulfilling prophecy as a "belief that comes true because we are acting as if it is already true." Kaufman touts the phrase "fake it 'til you make it" and she's not wrong. In the same article, Kaufman makes a valid point as she describes an entrance into a party where you don't know anyone. If you walk into a room seeming confident (even though you're uncomfortable), shaking hands and flashing smiles, you're likely to fit right in. If you allow your discomfort to take the reins, you're going to give one-word answers, not smile as much and, potentially, turn people off. Fake it 'til you make it. Usually, things will come your way. You may have heard about the book The Secretby Rhonda Byrne. It takes "mind over matter" to a whole new level. Byrne asserts that we must "give our attention to thoughts of what we want, and our lives will be filled with everything we want." Her documentary details the story of a man who taped a hundred-dollar bill to his ceiling and stared up at it every morning. His mind looped around a constant reel of fortune and success. He went on to become the author of the wildly popular Chicken Soup for the Soul series and has plenty of hundred dollar bills in his bank account today. He attributes his success to the same power that Byrne teaches in The Secret, the Law of Attraction. In the world of fiction, self-fulfilling prophecy is a useful literary device. In a story of happy triumph, we're watching a character assert all their power to make their vision become reality. It's exciting to watch them push through to the end, despite some rocky roads. In a villainous plot, we're watching a deranged lunatic feverishly hunt down others in an unhealthy act of self-preservation, only to meet their own demise in the end. It's almost a cousin to irony, and that always adds a nice dash of anticipation to any plotline. In real life, psychology loves to explore this type of concept because it can promote a healthier lifestyle. What's the harm in believing in yourself and envisioning your success? Nothing. It motivates you to stretch as far as you can go. Things only take a turn for the worst when you put on an air of naiveté or become arrogant. From Greek tragedies to modern-day living, self-fulfilling prophecies will continue to be one of the best spices of life. "Self-Fulfilling Prophecy Examples." YourDictionary, n.d. Web. 18 April 2019. <https://examples.yourdictionary.com/self-fulfilling-prophecy-examples.html>.